VEGAST® is inspired by ROTOR’s racing heritage to commemorate our 3 historic victories of the Grand Tours - Tour de France (2008), Vuelta España (2011) & Giro Italia (2012). Our new crankset is named in honour of 3 of the highest climbs of these iconic races: VEleta – GAlibier - STelvio. so you can challenge yourself on the steepest of cycling climbs. 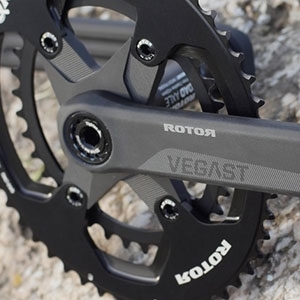 VEGAST® 's innovative modular system allows you to select each crank component based on your unique bike setup and physical characteristics and includes both Road & Track versions. 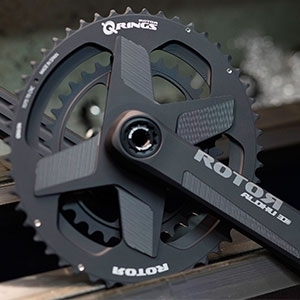 Choose your set-up from ROTOR’s one-piece Q RINGS® or Round Direct Mount chainrings or classic spider plus oval or round chainrings. Direct Mount technology features a proprietary spline interface connecting crank arm, axle and chainring allowing you to easily assemble and disassemble your crankset with only one bolt. Combined with Q RINGS®, OCP mount technology allows you to adjust your Optimal Chainring Position (OCP) to within one degree increments to precisely configure your unique OCP to maximize power output to your distinct pedaling style. Crafted using expert CNC processes, VEGAST® includes our Trinity Drilling System, with three internal holes from axle to pedal, giving the dual benefit of an exceptionally light crank with superior stiffness to take on the most challenging rides.